Microcontroller will come programmed and ready to go. 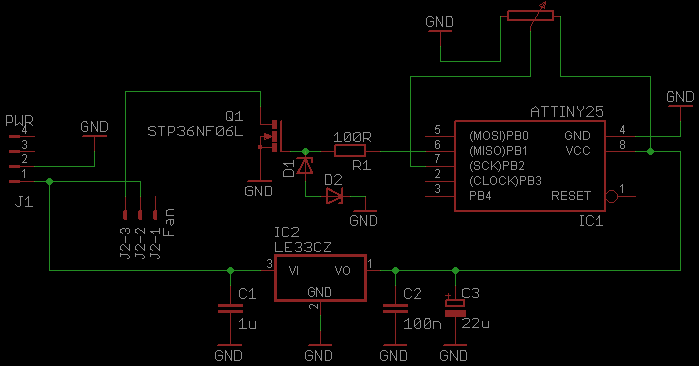 So this is a bit of a continuation on my 555 timer based PWM controllers, but now using microcontrollers and MOSFETs instead of 555 ICs and transistors. I made 2 versions, one with switches for speeding up and down and the other with a potentiometer like the previous controllers. 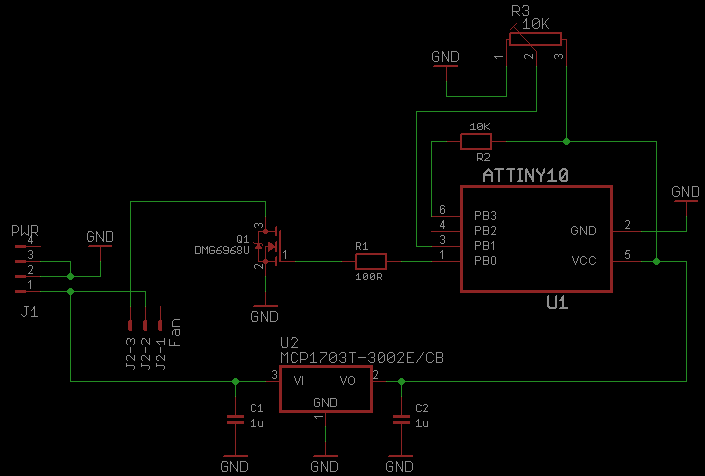 I used ATtiny25 controllers running at 31.25KHz (8MHz internal RC / 256 prescaler) with a 3.3V supply, the MOSFETs I used are STP36NF06L with 0.045Rds and 2.5Vgs max, perfect for 3.3V, the MOSFETs only generate ~180mW of heat at 2A ((0.045Rds * (2A * 2)) = 0.18W) so no heatsink needed, you can barely feel them getting warm. In the schematics change R1 from 100R to 150R if you use a 5V supply to keep the current under 40mA (remember, MOSFET gates need to be charged and discharged and doing this without a resistor is going to send large currents though the uC), the zener diodes D1 and D2 are for ESD protection and need to be rated somewhere between a few volts above the uC supply voltage and below the max gate voltage for the MOSFET, usually 20V, I used 12V zeners, they can be removed if you think you don’t need them, some MOSFETs have them built in. 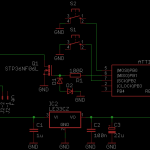 D2 is not actually needed even if you do want ESD protection since we aren’t using any negative voltages at the MOSFET gate. The STP36NF06L MOSFETs can easily switch ~8A as they are in the circuits, but some heatsinking will be needed and a 5V supply is recommended, wiring up 2 MOSFETs in parallel will reduce total heat generated (make sure they’re both on the same heatsink), but don’t forget appropriate gate resistors like a 56R which then splits to two 150R which go to the gates, max gate current will then be ~39mA. 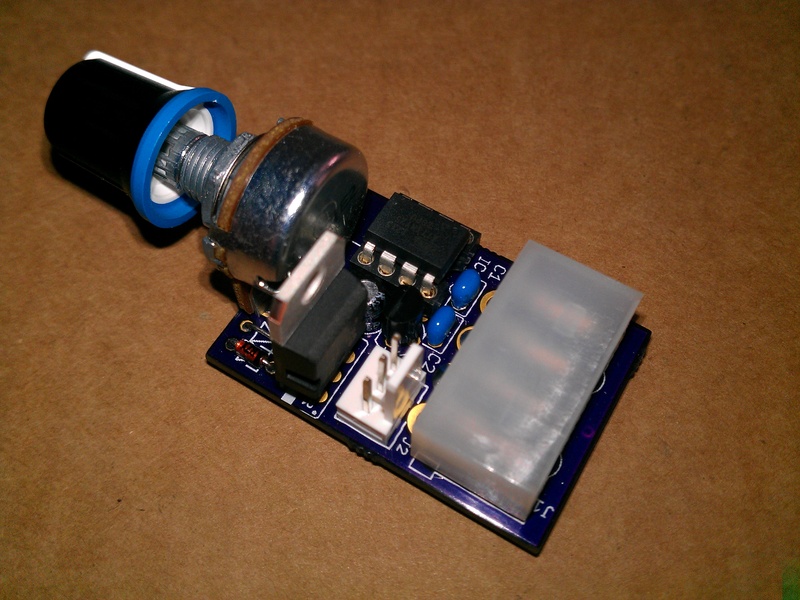 The potentiometer can be almost any value, but too high will cause the microcontroller ADC to return incorrect readings and too low will cause excessive current drain, I used 22K since it was on special offer for £0.17 instead of £0.43, but anywhere between 4.7K and 22K will be fine. 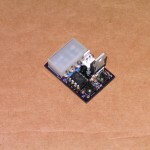 New SMD edition using an ATtiny5/10 microcontroller and DMG6968U MOSFET (has built-in zener diodes for ESD protection), no problem switching 2-3A. Invalid data in file fanController_analogue.sch! Invalid data in file fanController_analogue.brd! Invalid data in file fanController_digital.sch! Invalid data in file fanController_digital.brd! Any ideas why the files seem to be corrupt? Hey, the board and schematic were made in 6.2.0 Light Edition, 6 and newer save files in a different way which earlier versions don’t support. Could you please be more specific, what’s the rated voltage/current of the fans, and what’s the supply voltage of the device? Its designed for PC fans which are normally 12V, the current will depend on the fan, normal PC fans usually take less than 0.5A, but I was using a server fan taking up to 3A. 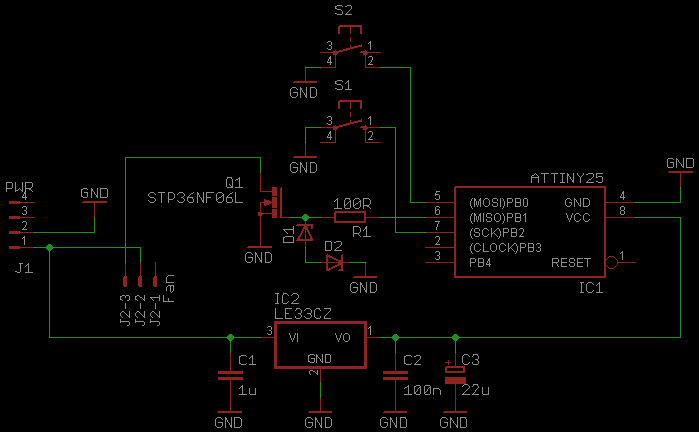 The MOSFET should be able to switch 8A before it gets too hot without a heatsink. 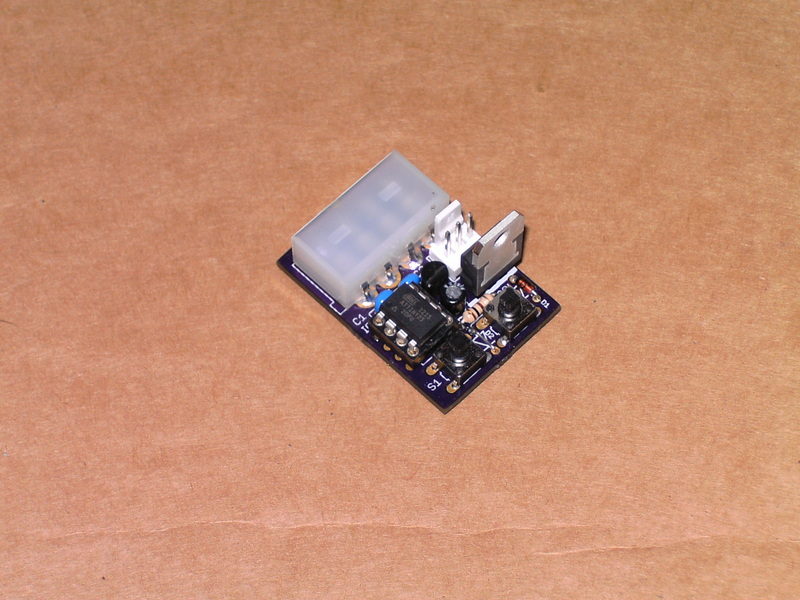 The minimum voltage for the controller part is 3.5V since it goes to a 3.3V LDO regulator. 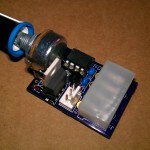 hey….can you share the basic algorithm of pwm fan controller . It’s manual control, turn the potentiometer to adjust fan speed. 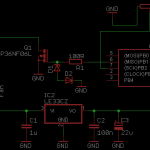 Algorithm is just set the PWM value to what the ADC reads from the potentiometer (a value 0 – 255). Hi, config.h contains the settings for the CPU clock divider (CPU_DIV, change it to clock_div_1) and analog or digital mode (CFG_INPUT). To change F_CPU go to the Project properties > Toolchain > AVR/GNU C Compiler > Symbols and you should see an entry “F_CPU=31250” in Defined symbols, double click it and change it to “F_CPU=8000000UL”. On my oscilloscopei have a PWM Frequency of ~61 Hz. I can increase and decrease the Dutycycle as described. Power Off and Power on is functioning perfect (Data saved in EEPROM) . Compile without any errors and load to CPU. Must be the same HEX File you have made. What else could i have forgotten? Alright then, I’ve sent you an email. Sorry the e-mail adress [removed] is wrong !!!! 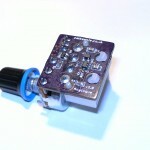 I have found following solution to get the right PWM frequency of (~2 Hz) which is ok. The project i have mentioned to pay for will be extended . I have no Paypal account but we can setup an professional solution with some extended specification. I will contact you direct on your e-mail adress. Could you give us your direct e-mail or phone Nr so we can discuss the project . what program do you draw the diagram ? Thank you for sharing your design. Excellent! Would you please advise how to set the output frequency to 100-500 Hz? 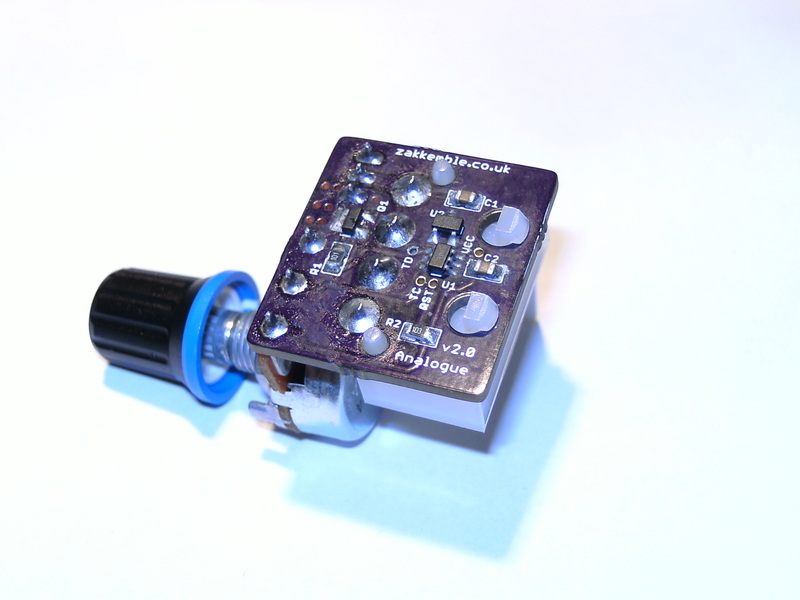 I want to use this to dim an led driver which needs that range. With the current code I am reading 1-30KHz. Hey Fred, at the moment it runs at ~62Hz. To run at other frequencies you’ll need to change the CPU prescaler value (clock_prescale_set() function in init()) and the timer prescaler setting (TCCR0B register in init()). The code is pretty well commented so it should be pretty easy to see what everything does. 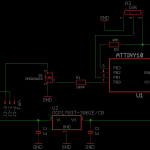 The ADC prescaler might also have to be adjusted so it doesn’t run too fast if you increase the CPU speed.